I read this novel because it’s one of six shortlisted for the UK Crime Writers’ Association International Dagger award for crime fiction translated into English. It’s August and Inspector Salvo Montalbano of the fictional Vigata police force (in the very real Sicily) is due to be joined by his girlfriend for a summer holiday. Knowing that he is often caught up with an investigation Livia demands that he finds a rental house for some friends of hers so that she won’t be bored while he works. Given the time of year he is very lucky to find something but it turns out to be a bit of a horror house. The family is treated to several infestations of creepy-crawlies and then their young son disappears. This leads to uncovering corruption in the local building industry and finding a hidden dead body. When they talk of this series most people talk of two things, the first being the characters. They certainly are terrific. I found Montalbano funny, nicely odd and a bit annoying at times but that did seem to make him more realistic that if he’d been entirely quirky and lovable. His penchant for stripping down to his swimming trunks at every available opportunity and his quest for a decent meal mostly made up for the somewhat tiresome ageing-related angst. The other characters that I assume are regulars, such as his intelligent offsider Fazio and the devoted if fairly incompetent Catarella, provided good contrast and most of the laughs. It is here too that Stephen Sartarelli’s translation kicks up a notch (from a starting point of excellent) to deftly show the divergent linguistic styles of the players. I did find the female characters a bit more stereotypical, and therefore far less interesting, than the men but it’s a minor point. The other aspect of these books that is always talked about is the depiction of Sicilian life and that was the standout feature for me. Of course there is the ever-present influence of the Mafia and the creative mechanisms the Police have to devise to thwart the institutionalised corruption but there are wonderful small details as well. Surely there’s nowhere else in the world that a suspect who felt a bit faint would be treated to a cognac? The August heat of the setting was also quite brilliantly depicted, though I thought they all needed to toughen up a bit but I admit I am a bit biased living in a place which endures many months of such heatwaves every year. I’m afraid I didn’t find the plot completely riveting though. For the first half it was decent enough but it really did become predictable and silly and Montalbano’s actions at the end were quite daft. Overall though it was a particularly fast book to read and I did have a smile on my face for a jolly good portion of it. I did enjoy the humour and the characterisations of both the people and the place and having read Norman Price’s excellent piece on Appreciating Camilleri I will seek out at least one of the earlier books in this series before making a final judgment on the canon. I have to say that this tour ‘in the footsteps of Montalbano‘ sounds wonderful…when do we leave? Bernadette – Thanks for this review. You’ve highlighted some really important features of a good series (at least to me): I like to get a real sense of the setting, and for me, the plot has to be believable. I’m glad you enjoyed this one. I’ll read it. I tried a Montalbano before but couldn’t get into it but I will try to read this one. 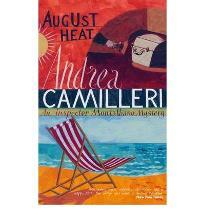 I did read “August Heat,” and liked it and like the political point of view of Montalbano’s. He had a statement about immigrant workers who should be honored by a monument in Rome, who give their lives for a crust of bread, that gave me goose pimples. Am now into reading his series.